The Roccat Sota is by far the easiest of the two items on test today to both review and to draw a conclusion about. It's packaged well, well built and designed well to match the whole of the Roccat SDMS range. Priced at £17 from Scan Computers it is in the upper price echelons of gaming surfaces. It performs as well as most other high-end mouse pads. It's quite large at 350mm x 270mm but looks fantastic in its electric blue with the subtle Roccat logo adorning the bottom right corner in crisp screen print. So is it recommended? Definitely. There is no reason at all to not purchase it. It is reasonably priced, looks great, performs admirably and is packaged well. Especially nice to see is the use of the two test materials built into the front. They are definitely of the same type as in the pad itself, rather than some extra high-quality items to tempt a purchase. 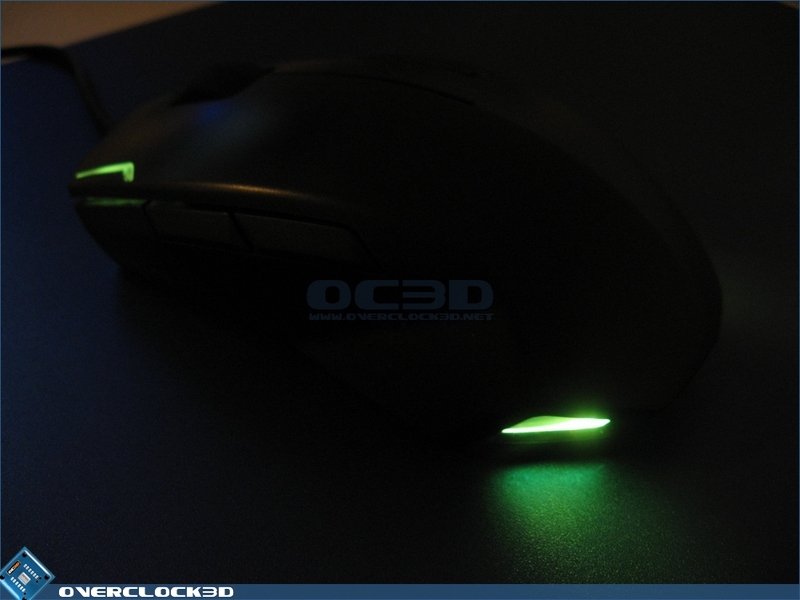 Available in both black and blue it matches the colour scheme of Roccat. It's often the case that when a manufacturer designs an entire product range around a single theme that one element of it is compromised in quality, or they introduce a steep price premium knowing that if you wish to indulge their holistic approach you will pony up the cash. So whilst it's pricier than I'd like to see, there is no doubting its performance and if you're in the market for a large gaming mousepad, the Roccat Sota should definitely be on your list. Sometimes the life of a reviewer is particularly difficult. You get a product that is, to all intents and purposes, fantastic. It does everything you could hope for, looks brilliant, works well and yet has has a couple of reasonable flaws, and one very big one, that make it extremely tough to recommend. So I'll start with what it does fantastically. Roccat are marketing this as a pure performance mouse. No frills, no software to set up, just high performance. It has that in spades. No test thrown in it's direction made it flinch in the least. From detailed work solely requiring precision, to frantic gaming sessions needing accuracy, speed and comfort. The design initially looks like it's a bit too angular to be comfortable, but it actually withstands enormous use without ever causing the famous "claw of death" long sessions can lead to. It's been used on average 14 hours a day continuously for the last week and not once did I find myself needing to stretch my fingers out. It works equally well in both grip styles. Personally I'm a fingertip guy, mainly due to having large hands, but it coped admirably. Spending some using it in the palm style also demonstrated what a fantastic design Roccat have come up with. All the angles keep the mouse right where you put it, and the two rubber pads either side do their job perfectly. Special mention has to be made of the Roccat logo embossed on the right mouse button. It definitely seems to be a combination of flagrant advertising and uncomfortable design when you first see it. But actually it's very useful. The depth of the lettering is perfect to just give your fingers a little extra something to grip on, without you being overly aware that it is there. The main event, the sensor, is fantastic. Fast, smooth and accurate, it is every thing that someone could possible ask for from a mouse. The multiple dpi settings enable it to be an all-rounder and not a specialist tool. Thankfully it doesn't suffer from the normal issue with all-round devices in that they aren't great any everything, merely good. This is great at everything. The buttons provide a firm tactile response and the scroll wheel, although a little notchy for my personal taste the size of it and excellent grippy coating ensure it's a winner. So why the hesitant recommendation then? So far it's everything anyone could ask. Unfortunately Roccat have really shot themselves in the foot, both with the claims and the pricing. Let's start with the problem I mentioned earlier. 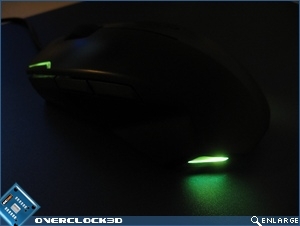 When we purchase a mouse that illuminates we normally have a choice between two or three colours and have to decide which best fits our needs. So allowing for that the six colours available would normally be a bonus. But as Roccat show us a full colour spectrum and promise the ability to have it in our favourite colour, it's quite a selling point and therefore quite a disappointment. Especially because it defaults to Cyan every boot and the light blue is extremely similar to that. Ah well, lighting is a disappointment but not a deal breaker. Unfortunately one of the things that puts a big crack in the deal is the method employed by Roccat to enable hardware adjustments of the various features. Firstly, although the right hand two buttons have to be where they are to enable the left-handed users to take full control, without software there is no way to move the back and forward buttons from the left to the right. Sure you can switch the LMB and RMB in the control panel, but when a mouse retails past £40 I shouldn't have to use the control panel to adjust things, especially as it's so limited. Secondly, the button combinations are easy to learn and it's quite an ingenious solution. But the main two elements you want to adjust, the colour of the mouse (because it always defaults to Cyan) and the resolution. Both of which use button 5, which is the back button and using it as part of a combination doesn't disable it's main feature. So it comes as no surprise that I've gone back on mouse pages, back on weapons, thrown grenades at my feet, undone Photoshop work etc. A pretty serious flaw in the design. Especially as utilising the forward button for the combination would eliminate most of these problems. Finally the major fly in the ointment, the problem that splits the deal asunder, Scan Computers currently have the Kova listed at £44.91. This puts it firmly in competition with the Razer Deathadder, the CM Storm Sentinel and, most tellingly, Roccat's own Kone. If we compare it to the Kone it's obvious Roccat haven't fully considered their own range. The Kone comes with proper customisation software allowing re-assignment of all the buttons and the mouse sensitivity, along with a profile manager. It has 38 colours available and you can assign them without having to cycle through a fixed order. It has adjustable weights to suit all users. And the sensor has the same adjustments, but has a 1000MHz polling rate and 1ms response, double the Kova. So the Kone is by the same company, has a vastly richer feature set, more illumination options, more customisation and comes at the same price point. Which makes the Kova, apart from it's ability to fit in with the design of Roccat's SDMS, almost wholly redundant. This is before we even look at any competitors products. I know that is a lot to get through, but it's important to understand that if the look of the mouse and the ability to just plug it in anywhere without having to install drivers or software are the key part of your needs, this is highly recommended. It does everything it should with style and panache. If what you want is the best performing, fullest featured mouse available in the highly competitive forty pounds mark, there are lots of choices and the most likely product to leech all the sales from this mouse come from Roccat themselves. If it was priced in accordance with its features, at maybe 25 to 30 pounds, then it would be a no brainer recommendation. At £45, I just can't recommend it compared to the alternatives. Many thanks to Roccat for providing both the Kova and the Sota for todays review. Let us know your thoughts in our forums. Looks like I'm going to have to the Kone.